She is Cree from Athabasca country — home of oil sands extraction — yet it was in the Alberni Valley where a storm brought home to Nitanis Desjarlais the critical need for climate action. Desjarlais is the local organizer of a “toolkit” workshop in Port Alberni hosted by Edmonton-based Indigenous Climate Action. The gathering on Monday at Hansen Hall is designed to ask questions and shape responses to a shifting climate. She was looking forward to an opportunity to engage with workshop participants and Dawn Morrison, a facilitator specialized in Indigenous food sovereignty. Around the same period, her family began to reconnect with Ahousaht, her husband’s home territory. Through the wisdom and knowledge shared by elders, she found strength. She used her media skills to produce the film We Are Nuu-chah-nulth, which is still available on YouTube. She got involved with a group called the Vancouver Island and Coastal Communities Indigenous Food Network. She realized that the Indigenous past could provide guiding experiences from times of natural disaster or famine. Over the past decade, family ties took her back to Athabasca country — her mother hails from Fort McMurray — as First Nations protested oil sands development. First Nations have felt the immediate impact over an area larger than England, their water left undrinkable, health endangered, traditional lands laid to waste. A series of healing walks were held from 2009 to 2014 and involved long journeys on foot through the industrialized landscape. “My grandmother, 90, she would lead the walk, and my mother would walk as well,” Desjarlais said. Back home, those emotional, front-line experiences shape her sensibilities. Climate is at the intersection of Indigenous food sovereignty, a movement Morrison has been involved with for years. ICA welcomed her experiences engaging a diversity of Indigenous communities. She draws from science to explain the status of climate change and challenges participants to relate this to their own knowledge. “What are the challenges and some of the ways that Indigenous knowledge can inform our actions and strategies? As individuals, how can we change through really practical, household actions.” She acknowledges the immense challenges but prefers a positive outlook. “It’s a beautiful struggle and we have to start seeing it that way,” Morrison said. The need to respond to a changing climate reawakens an innate Indigenous relationship with the land that in many cases is dormant but not lost. It becomes a healing journey for Indigenous people who have been displaced, she said. Desjarlais sees the climate shift as earth’s balancing act, a state of flux in search of equilibrium. She remains hopeful that Indigenous knowledge will light the path forward. 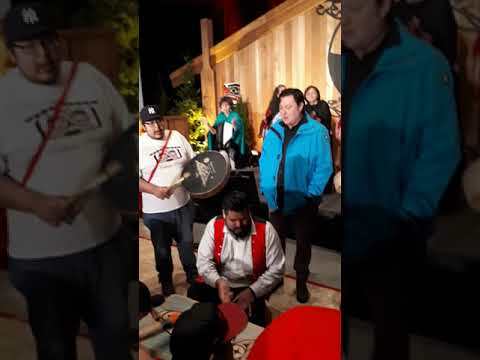 Her daughter, musician Kalilah Rampanen, who took part in the Alberta healing walks together with other Nuu-chah-nulth youth, will perform during Monday’s workshop. The event takes place from 9 a.m.-4 p.m. at the hall, 4930 Johnston Rd. Lunch is provided.